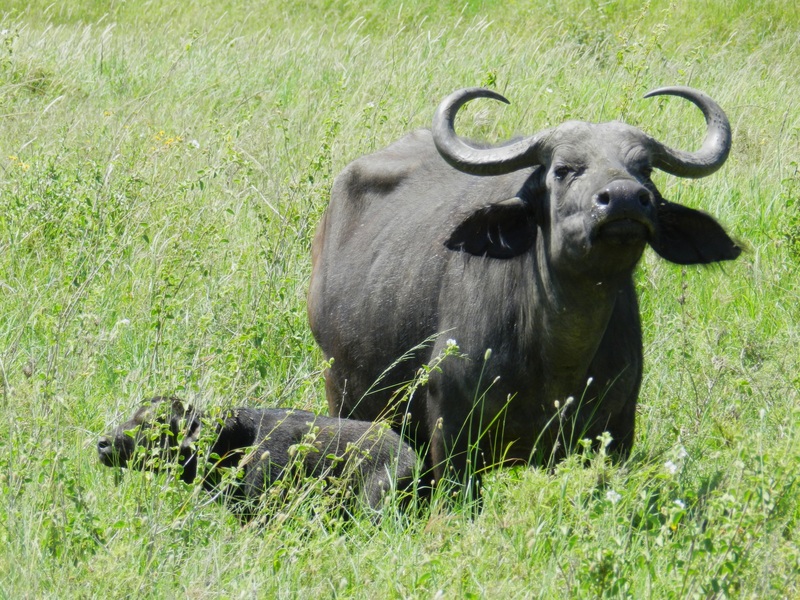 February to early March marks the annual “calving season” for the wildebeests of Tanzania…an incredible time to witness the synchronized birthing of some 300,000 – 400,000 wildebeest calves in a couple weeks’ time and to see the Great Migration. 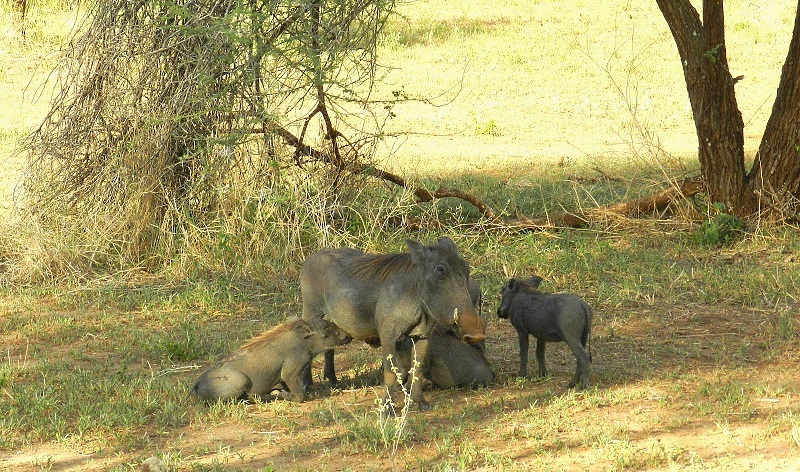 If you’ve ever considered going on a safari in Tanzania, this is a great time to go – the weather is mild and dry, the Great Migration is in play near Ndutu and the Salei plains (Southern Serengeti/Ngorongoro Conservation Area) and you might even catch a glimpse of baby wildebeest calves being born! 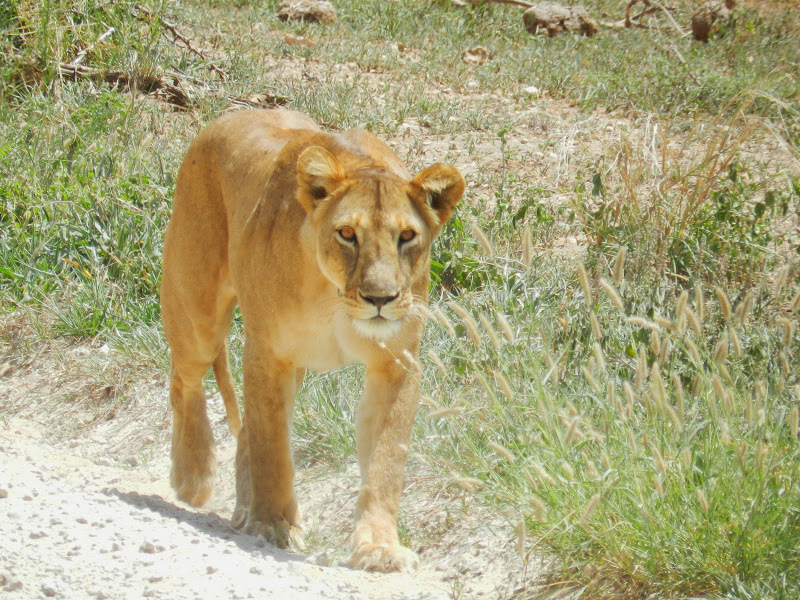 Following the millions of wildebeests, zebras and gazelles, predators like hyenas and lions lurk closely behind in hopes of easy prey, making it an even greater spectacle…and opportunity to see Tanzania’s wildlife and Africa’s Big 5: The lion, the elephant, the rhino, the leopard and the buffalo. 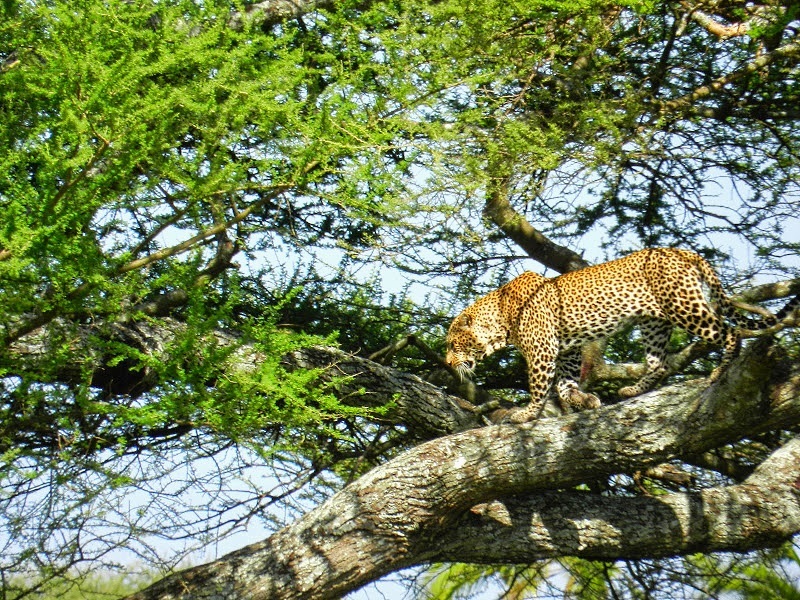 The term Big 5 was originally coined by big-game hunters and refers to the five most difficult animals in Africa to hunt – but is now popular vernacular for tourists and tour operators when discussing safaris. With our Good Earth driver and guide, Fadhili. 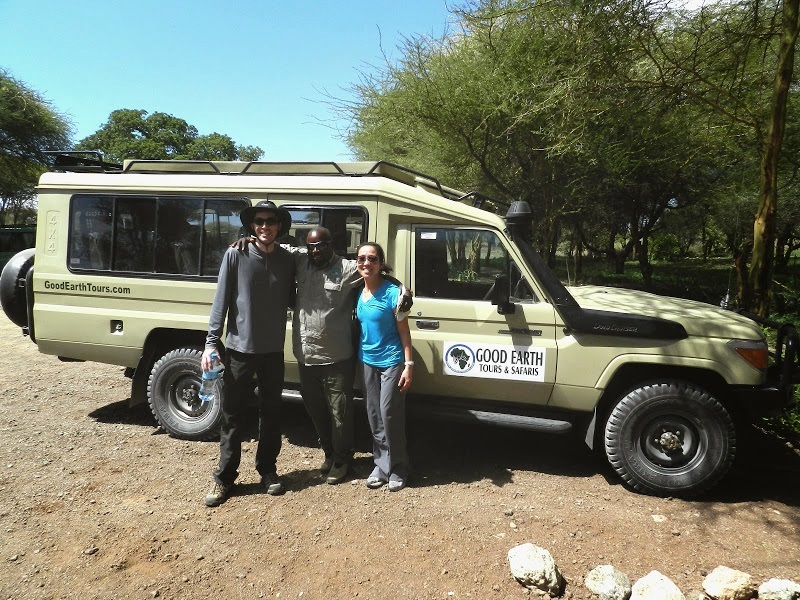 After landing in Kilimanjaro at 2am local time, we were picked up at the airport by a driver from Good Earth who took us to our first hotel for a few hours of rest. In the morning we began our journey. 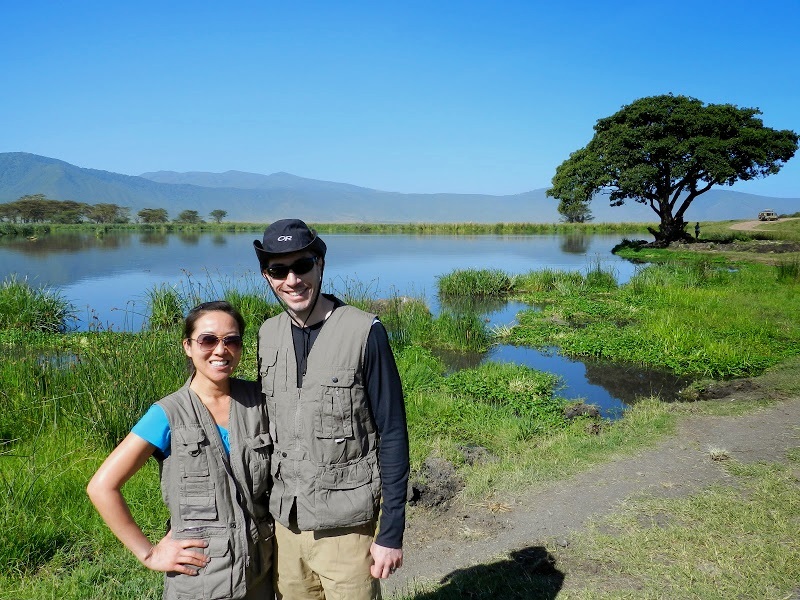 Our first stop, Tarangire National Park, is the sixth largest national park in Tanzania, with 2850 sq km. 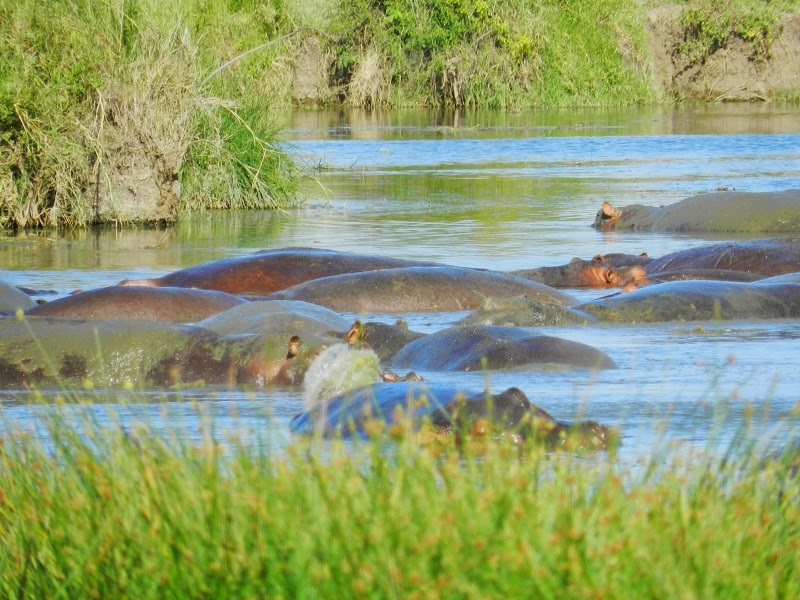 Known for its huge number of 300+ herds of elephants, it also holds the largest concentration of wildlife outside Serengeti. 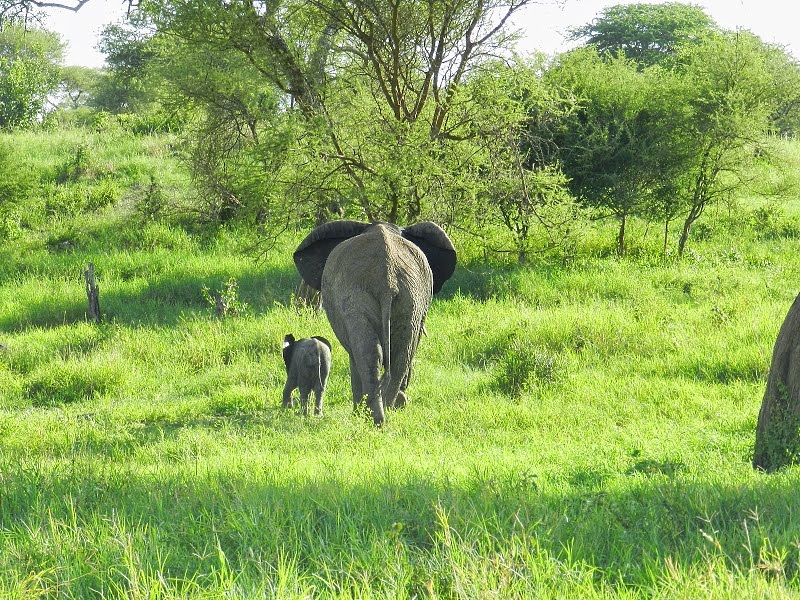 One of the surprises for me on our trip was how lush and green parts of Tanzania are. I always pictured the land to be vast, flat and brown. But how wrong I was! 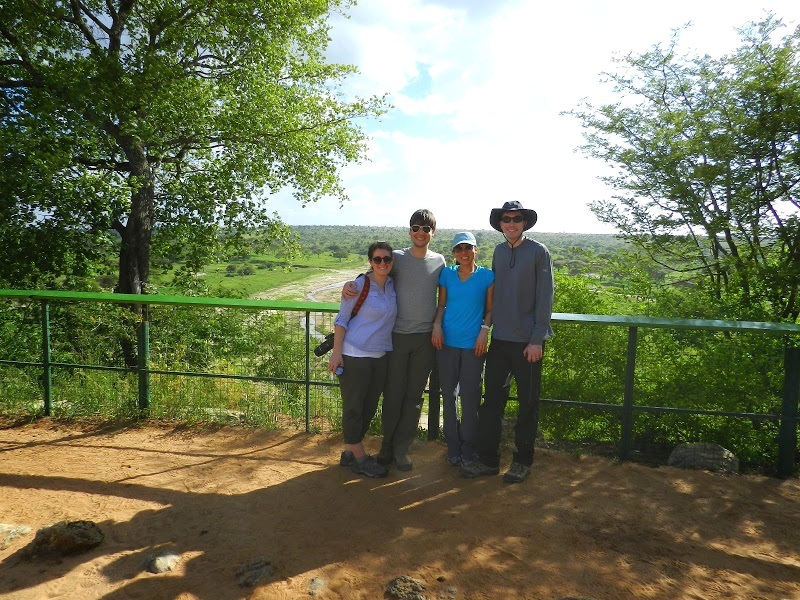 The scenery was stunning, with beautiful greens, trees and rolling hills – and different topography with each park. Definitely a highlight of the trip. 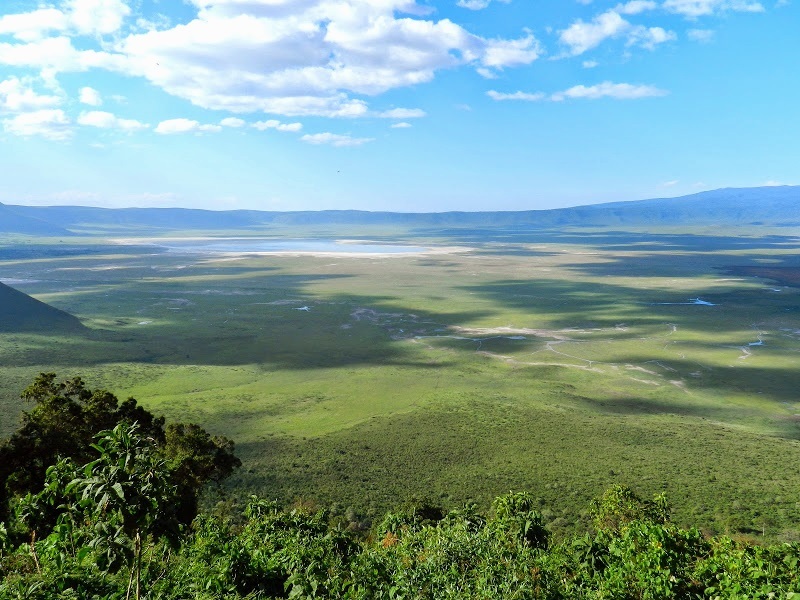 The main attraction of the Ngorongoro Conservation Area is the crater – one of the largest volcanic calderas in the world, it measures about 20 km across, 600 meters deep and 300 sq km in area. 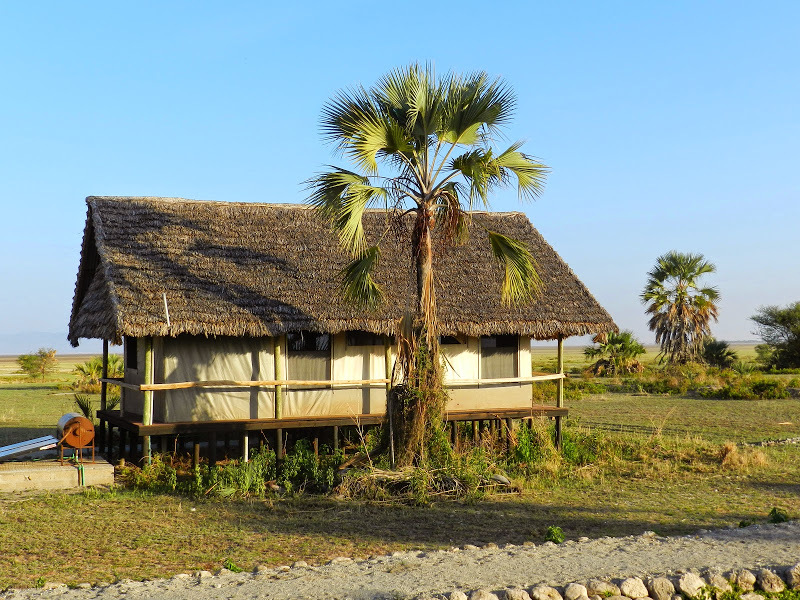 A lush green valley home to thousands of animals and a designated UNESCO World Heritage Site, the conservation area measures over 8000 sq km and is the only place on earth where wild animals and mankind co-exist in harmony. 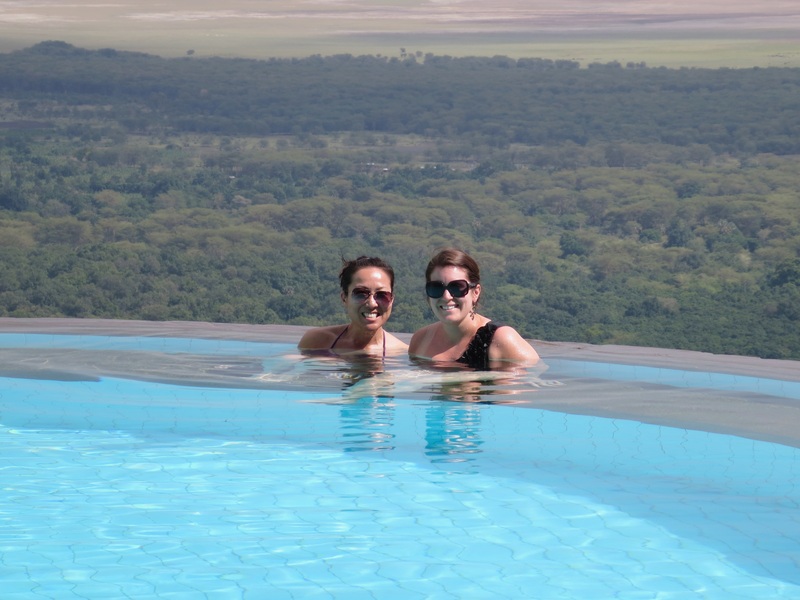 Sunset at the Ngorongoro Sopa Lodge, overlooking the Crater. 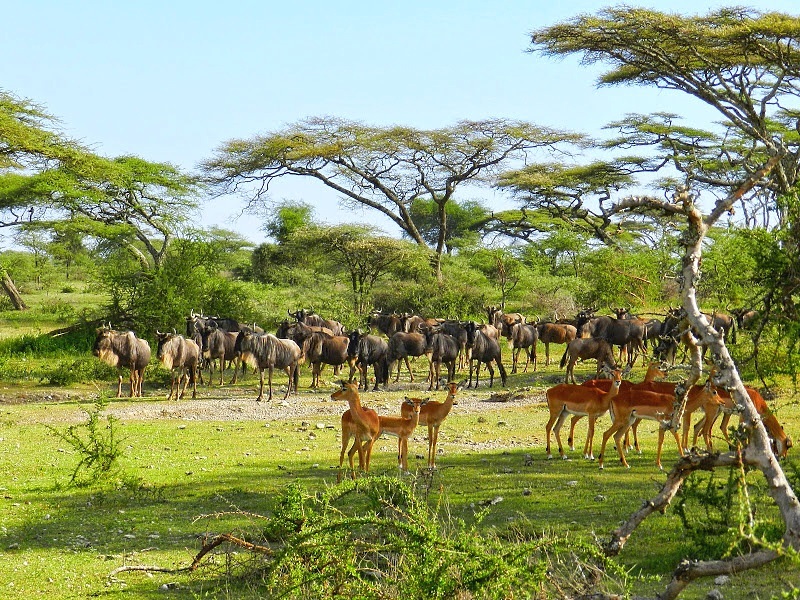 Tanzania’s oldest and most famous park, the Serengeti, consists of almost 15000 sq km of grasslands, woodlands and plains. 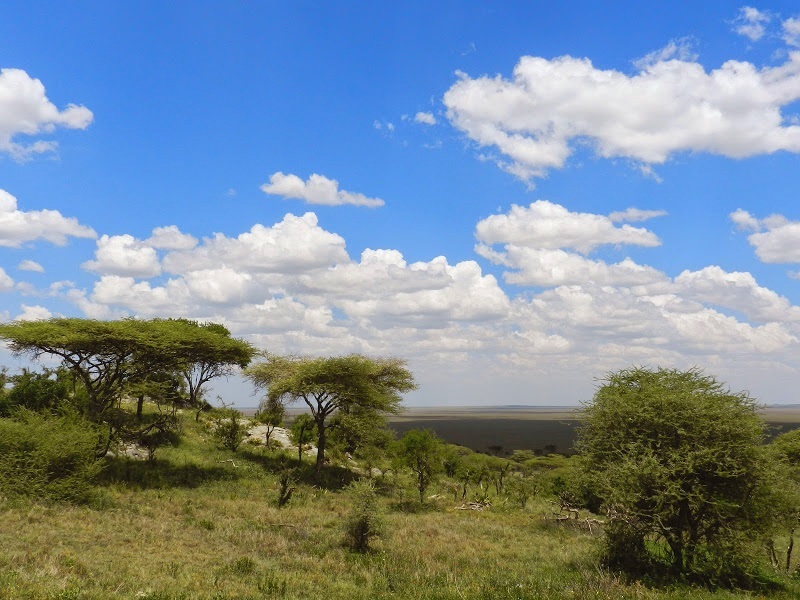 The Masai phrase “Siringet” means endless plain, hence Serengeti. The park does seemingly stretch on forever. Serengeti is famed for its annual migration of the millions of wildebeest, zebras and gazelles as they trek through their 1000 km pilgrimage. 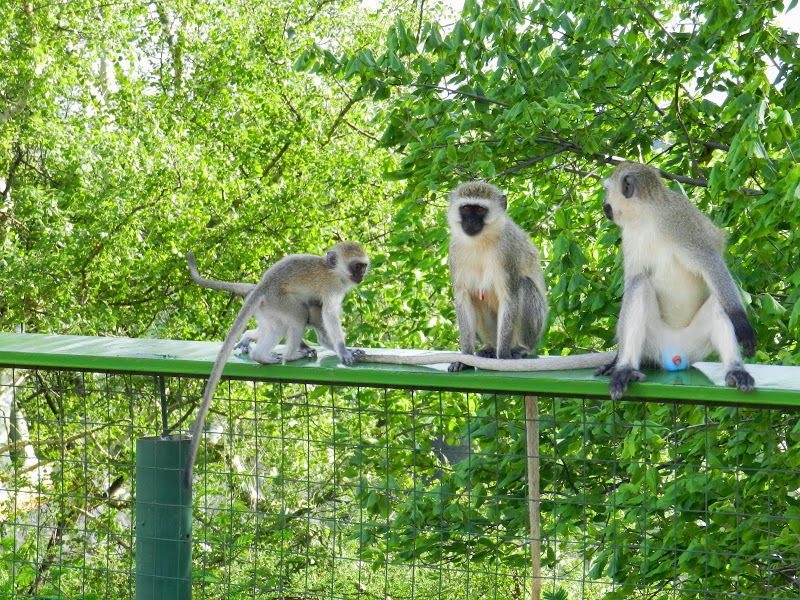 And now the fun part…our animal sightings! 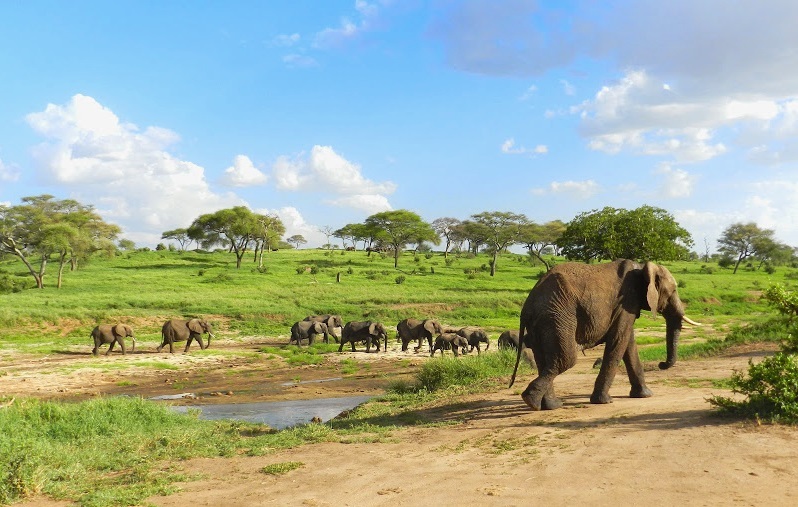 Elephants in the Tarangire National Park – beautiful majestic creatures. 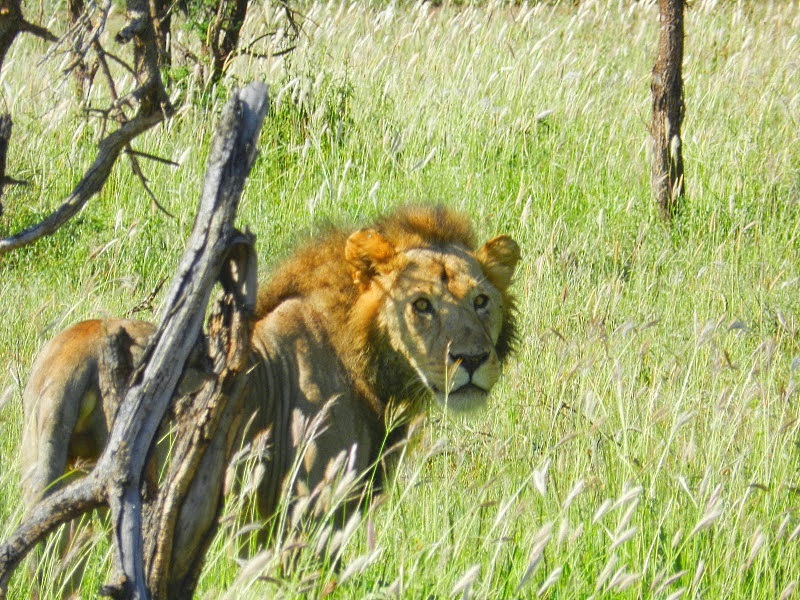 A male lion hides in the distance – they are far less likely to be seen out and about, as it’s the female lionesses who do the hunting. These cats aren’t afraid of people! 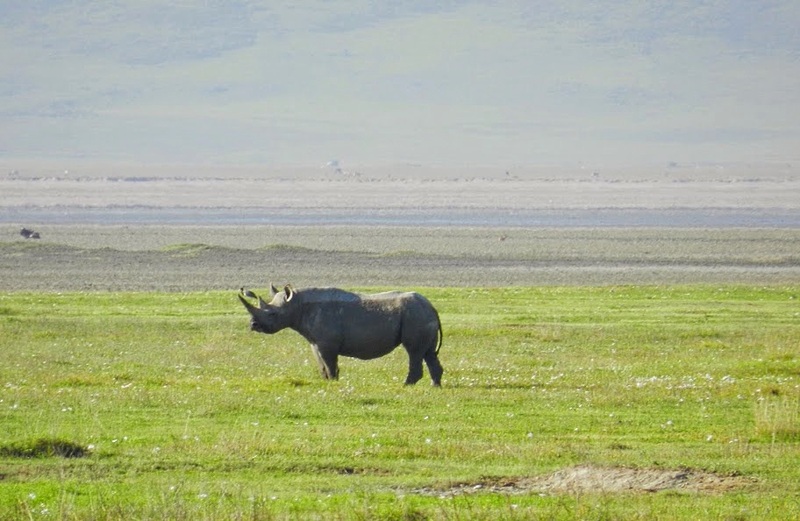 A rare sighting of the black rhino in the Ngorongoro Crater – sadly only a few left in the world. 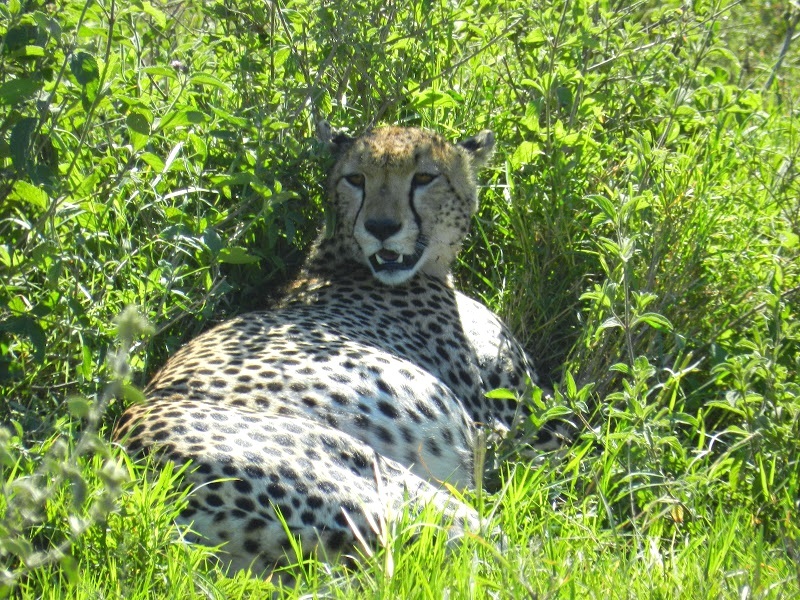 A cheetah resting in the bushes of the Serengeti. 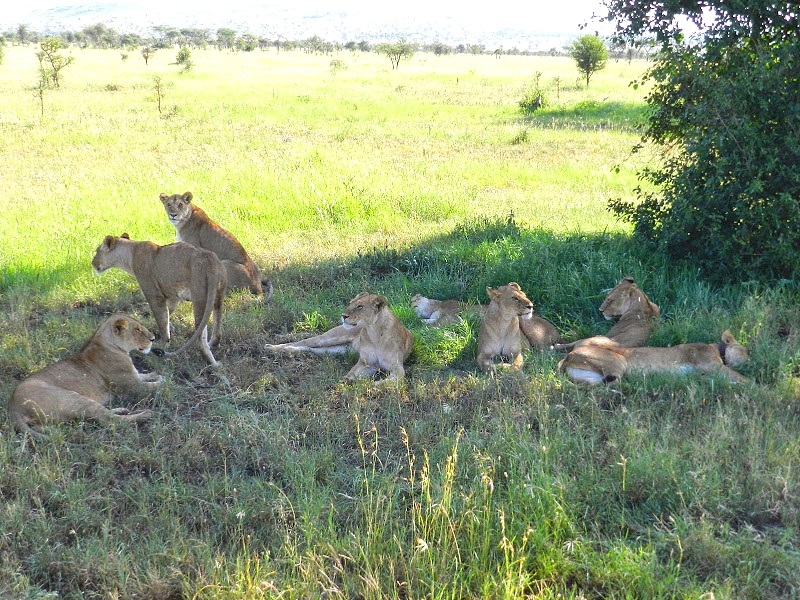 Female lionesses often hunt and rest in big groups – here we came across a large group of 8 on a lucky game drive. Gazelles and wildebeests often travel together in large herds and migrate across the Serengeti. 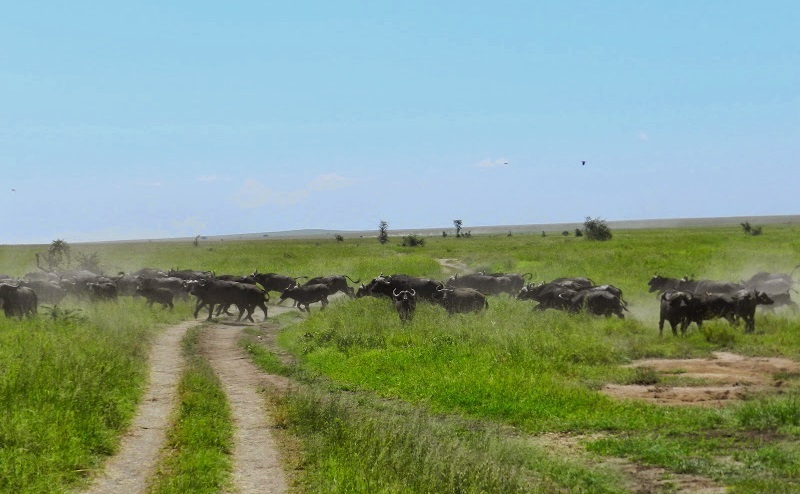 Experiencing part of the Great Wildebeest Migration – over 2 million a year migrate ~600 miles in search of food and water. 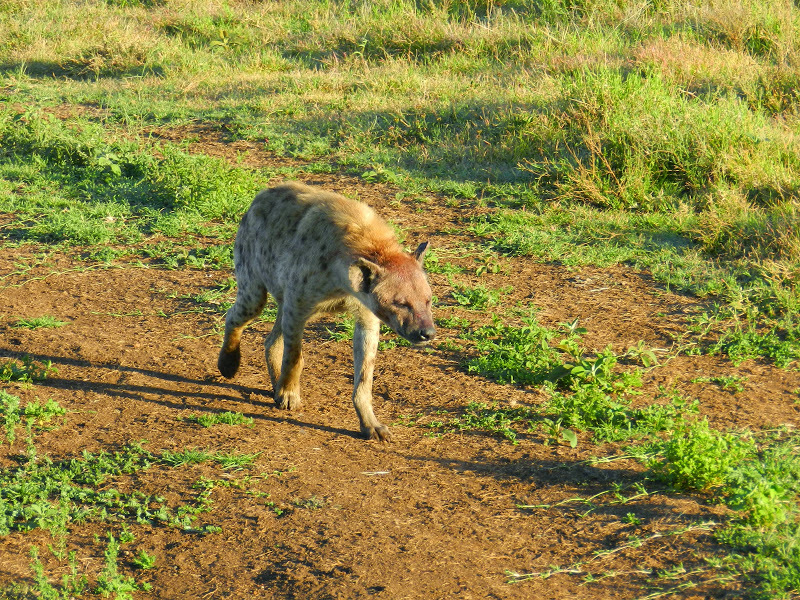 A hyena lurks looking for leftover lion kills. 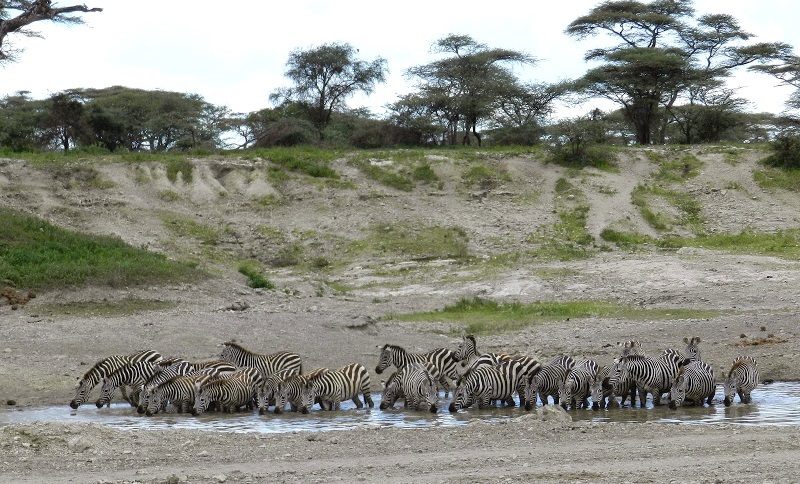 What’s a safari without zebras bathing? Calving season means lots of babies. We were lucky to see so many! 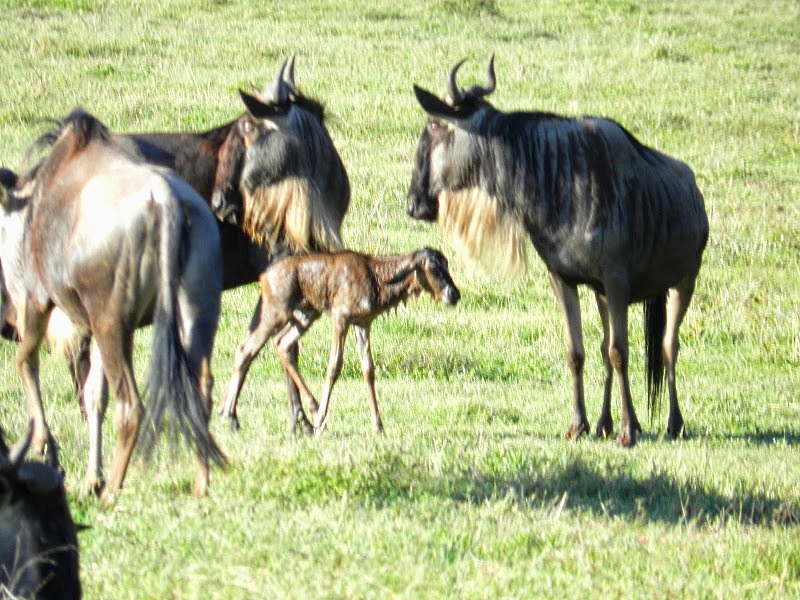 A baby wildebeest is born! Just a few minutes old and still wet from mom’s womb, it’s already standing and must learn to walk before predators come. 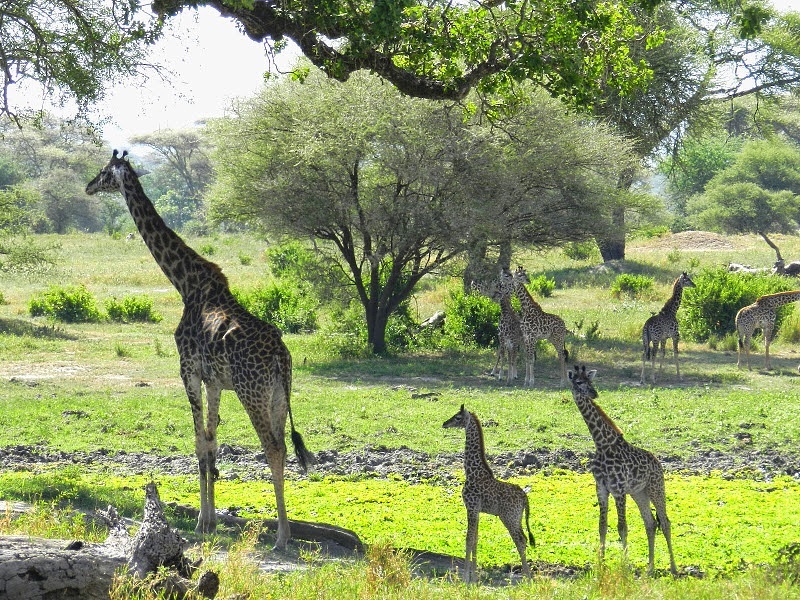 Mama giraffe leads the way as her babies follow closely behind. 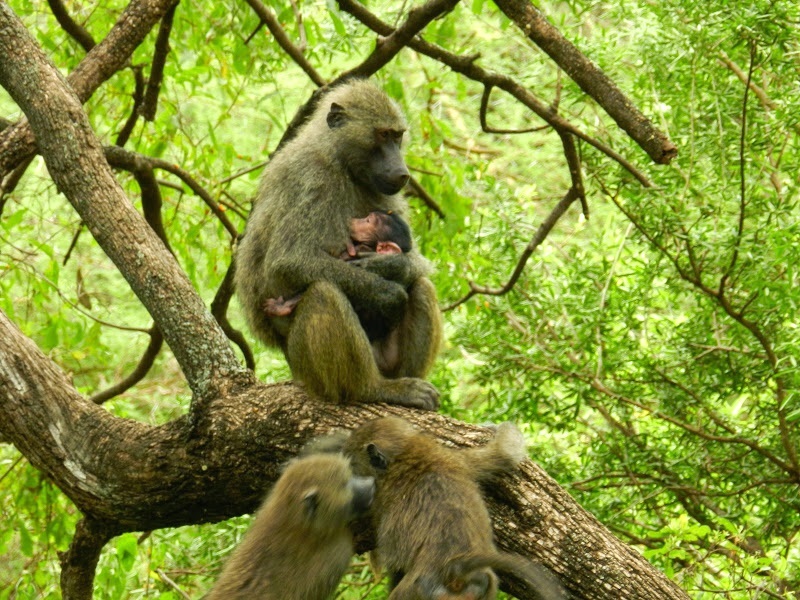 Baby baboon nursing in the trees. A baby buffalo hides in the long grass. 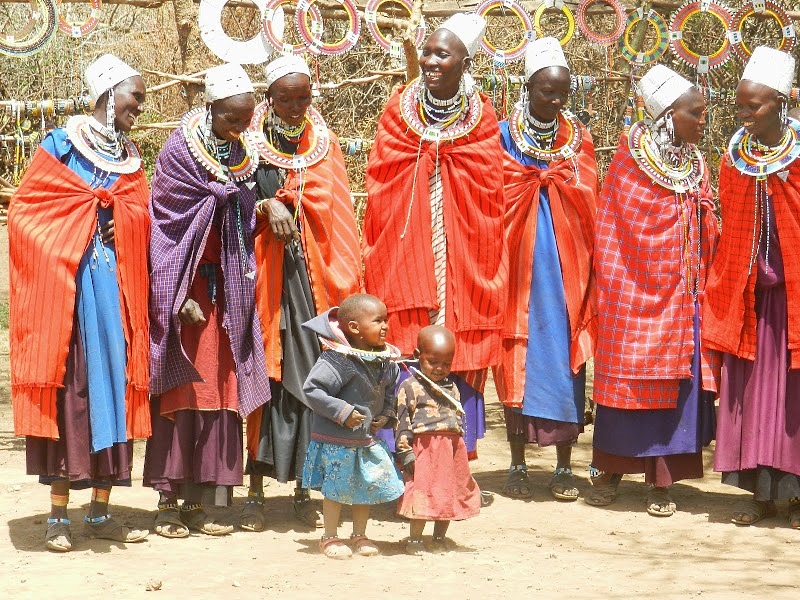 The women and children dancing at our visit to the Maasai Village. The Maasai are semi-nomadic people who live under a communal land management system in the southern Kenya and northern Tanzania. 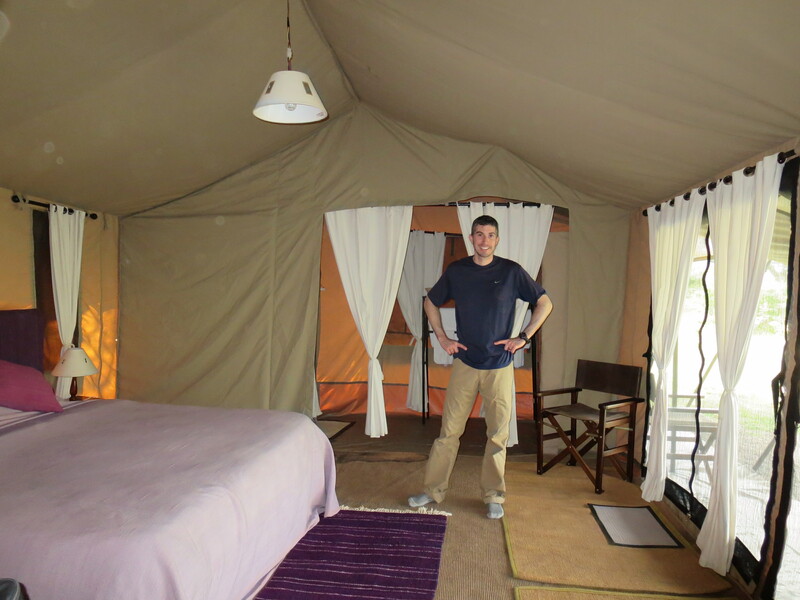 Our tent at the Maramboi Tent Camp at Tarangire National Park. 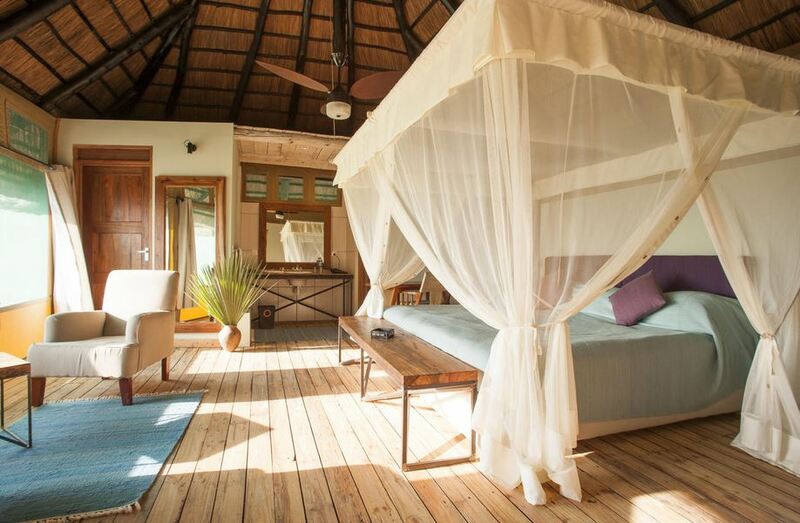 Inside Maramboi Tent – not too shabby! 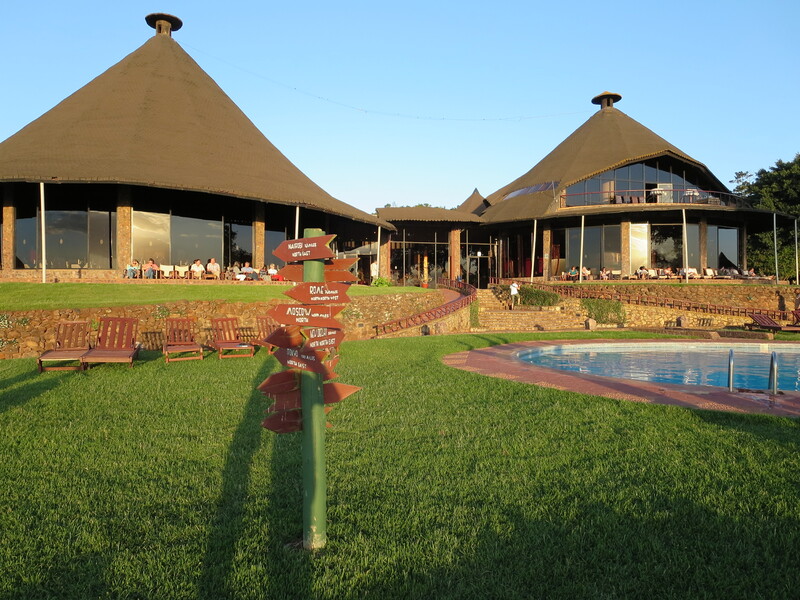 And we stayed in a couple hotels too 🙂 This is the Ngorongoro Sopa Lodge in Ngorongoro. What’s an African safari without some nice pool time? Jenni and I took advantage! Check the CDC site – read the pertinent health information and make sure all your vaccinations are up to date. 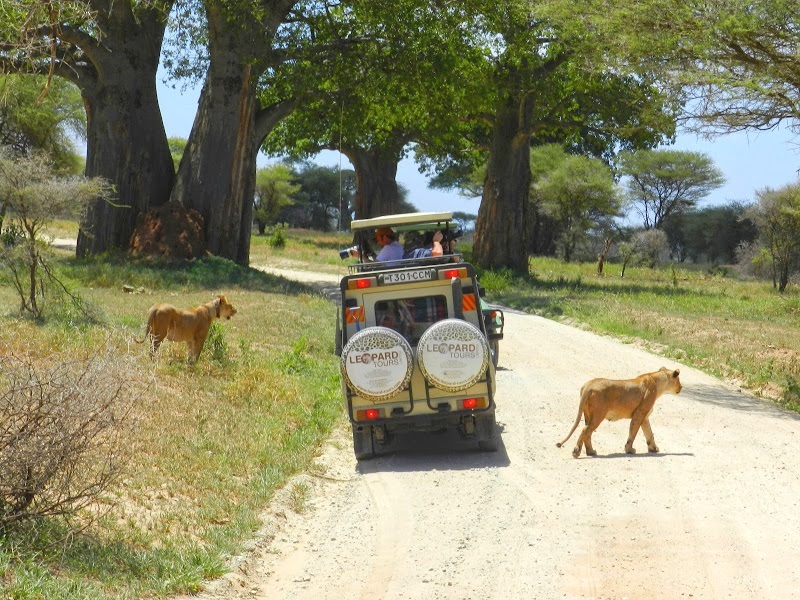 Hire a trusted tour operator – you will need one for the safari. We went with Good Earth Tours and they are highly recommended. 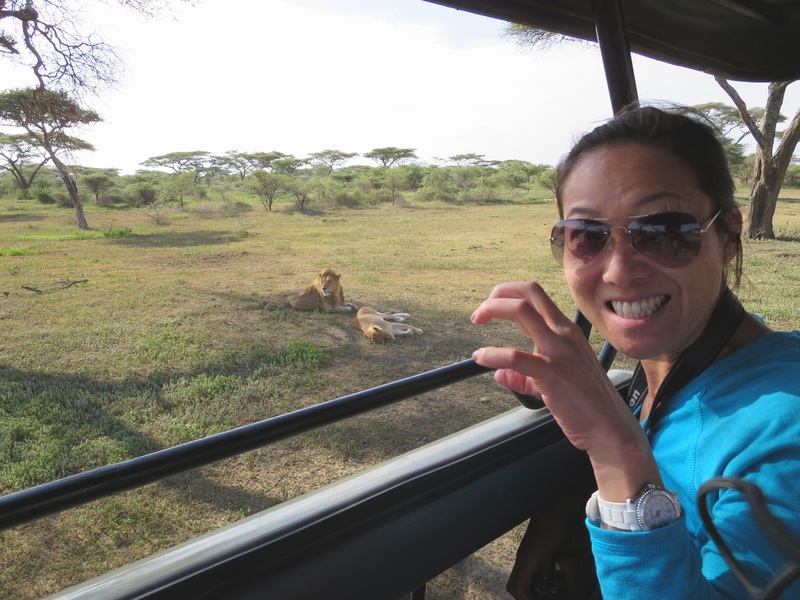 We had a great time and saw all the wildlife we could imagine (including the Big 5)! 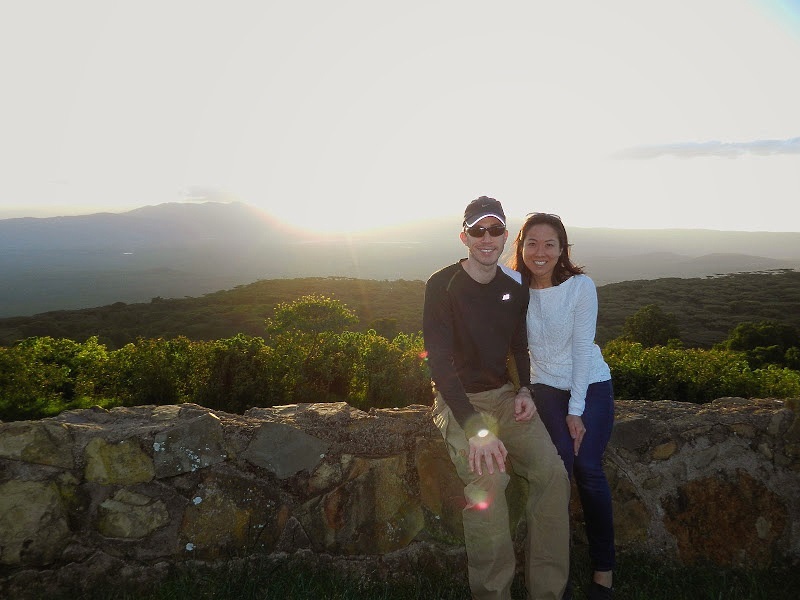 Our driver was knowledgeable and personable – I think it really makes or breaks the trip so take time to do some research. 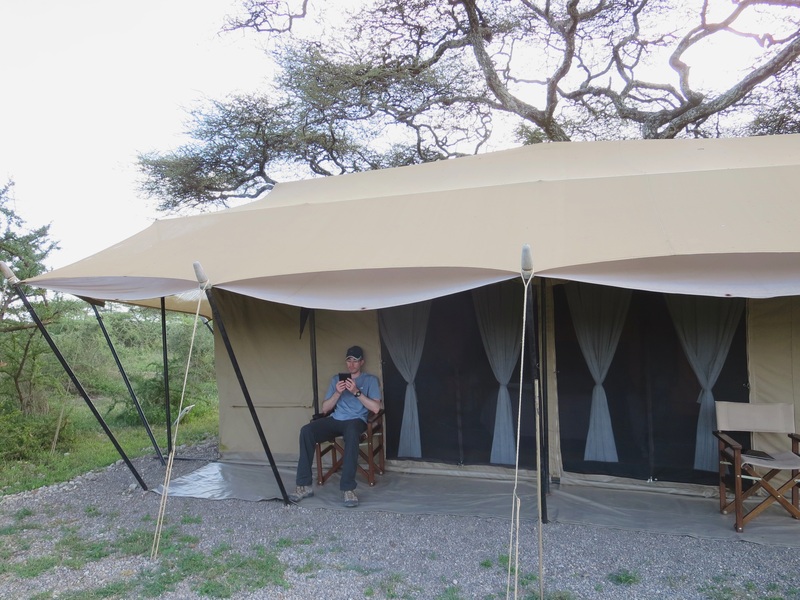 Pack wisely – with most safaris you’ll be constantly on the go, spending only one night or so at each place. Try to pack light and choose your clothing with care depending on the weather and time of year. Insect repellent, hats, comfortable light-weight hiking shoes and sunblock are must-haves. Binoculars and a good camera with zoom lens are also great to have on hand. Ladies, you might also consider wearing a sports-bra…those roads are bumpy and the jeeps are bouncy! 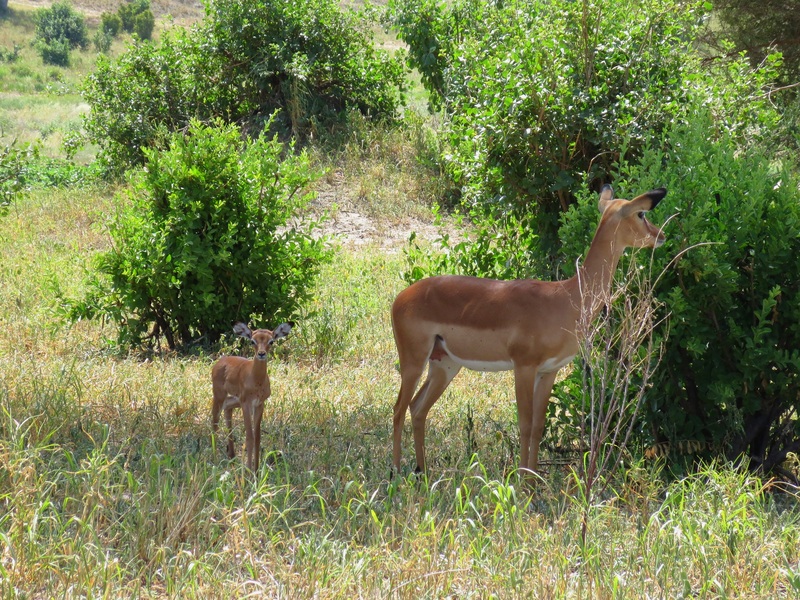 Don’t forget you’ll need a visa to enter Tanzania – it’s available upon arrival at the airport. The cost is $100 USD or $50 for residents of UK/European Union – payable only in cash so make sure you have enough to cover this. You can save some money by traveling with a bigger group. 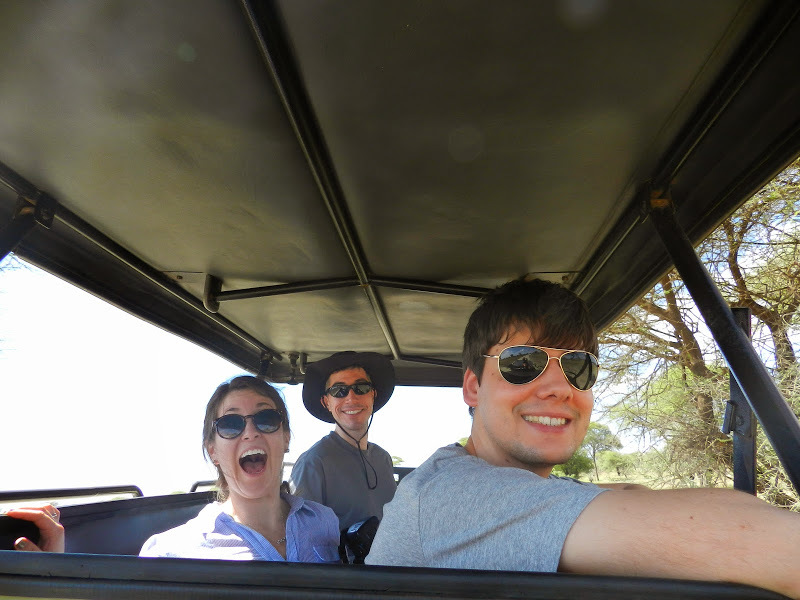 The jeeps can accommodate up to 5 or 6 people comfortably and you’ll be able to share the cost between more people (double-check this with your tour operator). Not only that but having more friends to share the experience with can also make for a better time. We went with our friends Thomas & Jenni and it was a great time.